Summary of today’s show: The Easter Vigil is the Super Bowl of liturgies in the Catholic Church calendar, with our most beautiful prayers and symbols and imagery, encapsulating all of Salvation History. For the first time this Easter, we will hear the prayers using the new translation of the Roman Missal, which restores the beautiful phrase lost over time. Fr. Jonathan Gaspar joins Scot Landry and Fr. Matt Williams to discuss the Easter Vigil and especially to chant the Exsultet, the Easter Proclamation, like you’ve never heard before. 1st segment: Scot and Fr. 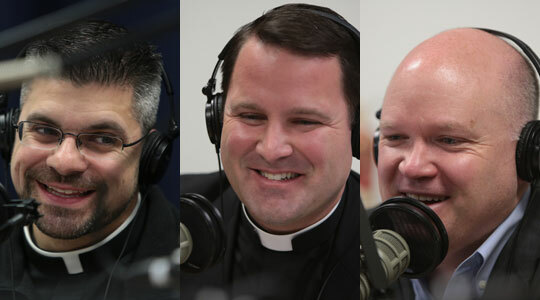 Matt discussed the topic for today’s show which will be the Super Bowl of liturgies, the Easter Vigil on Saturday evening. Fr. Jonathan Gaspar, the director of the Office for Worship will assist them with examining the Vigil Mass. Fr. Matt will be very busy on Good Friday and Holy Saturday, starting in Nahant and engaging in many service projects with the Hunger for Justice retreat for high school students. Fr. Matt said he has only been the main celebrant of the Easter Vigil liturgy once as a priest, because he’s either been a parochial vicar or head of the Office for the New Evangelization of Youth and Young Adults and it’s usually the pastor who celebrates. Also, tonight is the last opportunity for The Light Is On For You, to go to confession in any parish or chapel in the archdiocese from 6:30-8pm. Scot said the Mass is usually in two parts: Liturgy of the Word and Liturgy of the Eucharist. But the Easter Vigil is not just two parts. Fr. Jonathan said the Easter vigil is four parts: We begin with the Service of Light, the blessing of the fire in darkness outside of the church. This blazing fire scatters the darkness of night. This goes back to the second century and Eusebius refers to this in the fourth century, saying the Easter fire illuminated the city of Byzantium. The deacon or priest then proclaims the great praise of Easter. Scot talked about taking small children to the Easter Vigil, how they will love seeing all the different aspects. He suggested sitting in the back to see the events surrounding the lighting of candles. Then there is the Liturgy of the Word. There are seven readings from the Old Testament, which are the story of Salvation History, how the love f God for his people culminated in Easter; the Epistle from the New Testament; and the Gospel. Fr. Jonathan said it tells the story of how God remembers his covenant even when we have failed to love him. It tells the story of God calling us back each time, reestablishing his covenant. Finally the Father sends His Son to establish a new eternal covenant that will never be broken. Scot said you can’t walk away from the Vigil without being aware of God’s love for us. The third part of the Vigil is also different. It’s the celebration of the sacraments of initiation for candidates and catechumens. During Lent they have been preparing through prayer and examination of themselves to receive these sacraments. They receive the sacraments of baptism, confirmation, and the Eucharist. This part also helps everyone renew their baptismal promises. In a beautiful way we relight our own candles. The water of the baptism is sprinkled upon the people, reminding us of the blood of the sacrifice of the lambs sprinkled over the people of Israel during the first Passover in Egypt. Scot said it also reminds us of our own baptism. Fr. Jonathan said a funeral liturgy is like a mini-Easter Vigil, from the way t he body is greeted at the door to the church and blessed and carried forward and clothed in baptismal gowns and the use of the paschal candle and more. Fr. Matt said the funeral is first and foremost a celebration of the paschal mystery of Christ. The fourth part is the Liturgy of the Eucharist. Fr. Jonathan said every Mass is a celebration of the special meaning that the Eucharist has on Easter, receiving the risen body and blood of our Lord. Fr. Jonathan said at the cathedral they have the blessing of the fire outside because the rubrics say it should be a roaring fire. Then they will hold a procession around the cathedral. CatholicTV will broadcast the Easter vigil. Scot said the Mass always has to start after dark. Fr. Jonathan said this goes back to the 2nd century. In the 7th century they started creeping back the vigil to Saturday morning, but in 1951 the Vatican released a new text for the vigil that required that it take place after dark and finish before dawn. In the Archdiocese of Boston, parishes cannot begin until after 8pm. How can Christ cast out darkness if the sun is still shining. The symbolism speaks volumes when done in a dark church. Fr. Jonathan said at the beginning of the Liturgy the priest blesses the fire. The fire represents purification, passion, and illumination. The first should represent our passion for evangelization. to come together to watch and pray. and living with him in God. They then bless the candle, and the priest inserts some Greek letters and the numbers of the year. The priest then puts five spikes of incense. Incense is part of sacrifice and the incense signifies that the candle itself burns in praise. The incense is inserted in a shape of cross, representing the wounds of Christ. The candles is a symbol of the resurrected and glorified body of Christ. 4. and the Omega (he cuts the letter Omega below the vertical line). 6. and all the ages (he cuts the second numeral of the current year in the upper right comer of the cross). 8. through every age and for ever. Amen (he cuts the fourth numeral of the current year in the lower right comer of the cross). The candle is lit from the bonfire and the priest sings, and the deacon leads the procession of the people into the church, reminding us of the Israelites being led by God as a pillar of fire from Egypt through the darkness of the wilderness into the Promised Land. The church is the promised land, a sign of the eternal reward. Scot said he loves to see the church become lit up with the candles held by individual parishioners. It showcases the beauty of the churches lit only by candlelight, showing us how churches have traditionally been lit throughout the centuries. Fr. Jonathan said the new fire blessed in the bonfire is brought into the church by the paschal candle for all the individual candles and all the lamps of the church. The deacon sings a proclamation three times. This when the electric lights are turned on. sound aloud our mighty King’s triumph! that I may sing this candle’s perfect praises). (V. The Lord be with you. This was the first section of the Easter Proclamation. Scot said he doesn’t recall hearing the beautiful imagery of the building shaking with the voices of the people. That’s how he envisions heaven to be: Heaven rocks because everyone participates fully. Fr. Matt said when you’ve been entering the spirit of Lent and the Triduum, there’s a sense of your heartbreaking for Him along with Our Lady. And then the Holy Light and the church lights up and the proclamation says there’s great hope in the Resurrection. It’s amazing how you enter into realizing that without Christ there is darkness, but with the Resurrection there is great hope and joy. there’s something that happens in you that lifts up your spirit. Scot said all of Creation sings aloud the triumph of the cross and all Creation on earth is to be glad. The Church is involved in that. Fr. Jonathan said every single word is packed with joy. He said musically you hear all those beautiful lines. He said parts of the chant sound like bells and he’s convinced that when the bells of Westminster Abbey were made, they had this chant in mind. Another line sounds like a trumpet. The music matches up with the imagery of the text. He said are not to be shy as Christians. We have mighty voices because of what we celebrate this evening. At the end of this section, it shows that tonight we celebrate the Christian Passover. Scot said his favorite line was “to ransom a slave you gave away your Son! O truly necessary sin of Adam, destroyed completely by the Death of Christ! O happy fault that earned so great, so glorious a Redeemer!” Fr. Matt said the words before it are different from the previous translation because now they emphasis the love of God, love beyond all telling. Fr. Jonathan said these all come from St. Ambrose’s commentary on Scripture. His favorite line is “Our birth would have been no gain,had we not been redeemed.” Fr. Matt recalled the imagery of Christ breaking the prison bars of death. Scot encourages all listeners to come to the Easter Vigil at any parish in the Archdiocese. Fr. Jonathan said the morning star is the last star seen before the sun comes up. In Christian thought, Christ is the star that never sets.